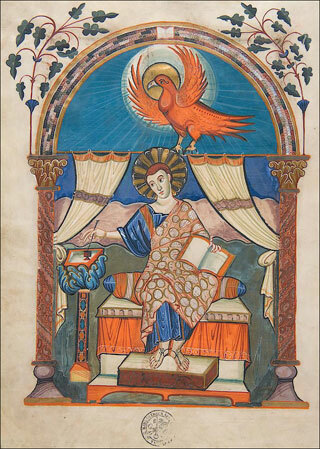 The "Lorsch Gospels" are today split into two parts. The first with prologues, canon tables and the gospels of St. Matthew and St. Mark is held in Alba Iulia, Biblioteca Documentară Batthyáneum, Ms R II 1. The ivory panels, which originally decorated the front cover of the manuscript and depict scenes from the life of Mary, are today held in London, Victoria and Albert Museum, Inv.-Nr. 138-1866. The panels with scenes from the life of Christ were formerly attached to the back cover and are today kept together with the Vatican text part under the same shelfmark Pal. lat. 50.